I’m doing an event in the Foyles in Westfield – in Shepherd’s Bush – next Saturday, August 14th. I’ll be there at 2pm. If you come along, make sure you bring a copy of this voucher, which gives you 20% off all children’s books in Foyles till the end of August. I’m going to be doing another event in London next month too: on Saturday 18th September, I’ll be at the Chiswick Book Festival. 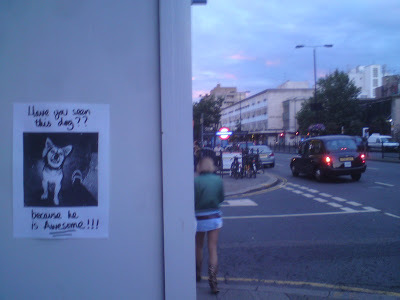 Posted on August 5, 2010 June 18, 2015 Categories Uncategorized1 Comment on Have you seen this dog? The seventh Grk book is published this week. (I’ve seen it described as the eighth and even the ninth, but it’s definitely the seventh. I’ve kept count.) If you live in the UK, you can order a copy from amazon or (I hope) buy it in your local bookshop. As you can probably tell from the title, it’s the story of Tim and Grk’s adventures in Australia.